"In 1679 a rōnin by the name of Hirai Gonpachi, a regular visitor to the Yoshiwara, was beheaded on the execution ground in Shinagawa. When he was sixteen years of age Gonpachi was said to have killed a man in his home province and subsequently escaped to Edo. Gonpachi followed this violent act by a series of thefts and murders in Edo until he was caught and executed. He would have been a criminal of no consequence, except for the legend that connected him with Komurasaki. 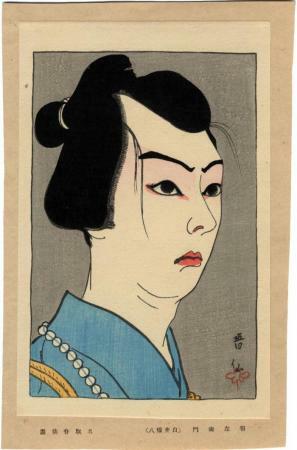 The fictionalized story tells us that Komurasaki was deeply in love with Gonpachi (last name Shirai in fiction), who was reputed to be extremely handsome. The legend says that, after his death, she had her wealthy patron purchase her contract. The night of her release, she went to the cemetery of her lover and ended her life with a sharp knife." Quoted from: Yoshiwara: The Glittering World of the Japanese Courtesan by Cecilia Segawa Seigle, p. 89. This is #181 in the Natori Shunsen (名取春仙) exhibition catalogue from Kushigata in 1991.